Q-member discount is a special offer only available to premium members. Satisfy one of the following criteria below to start receiving Q-member discount. Be our VIP! 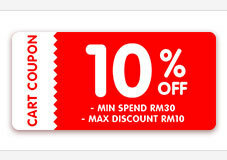 Get special discount coupons every month and other various benefits. How to become a VIP member? 2. Q-Access: Access Qoo10 through mobile app or newsletter to receive Q-member discount benefit. Recieved in good condition & good quality.